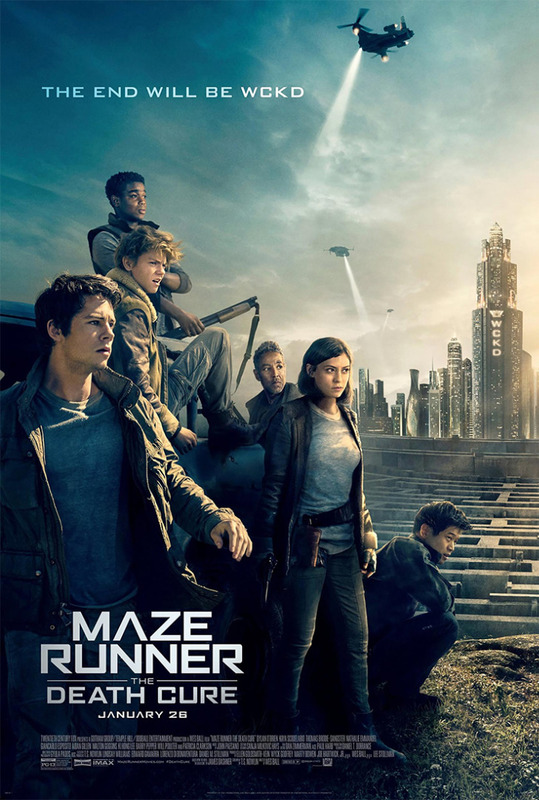 The last chapter of the Maze Runner saga in its epic conclusion. I’m very proud that I had the chance to contribute to this trilogy of films. Working directly with director Wes Ball was a blast. 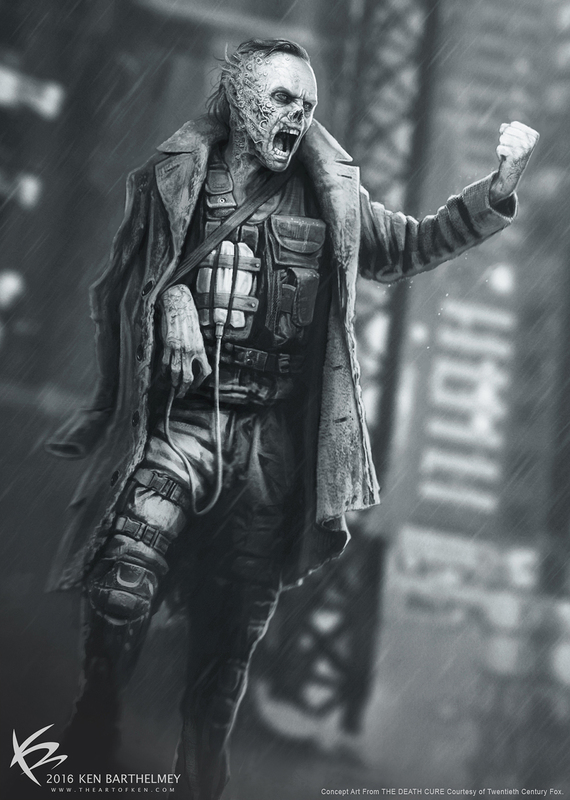 On The Death Cure my main task was to design the unusual and dangerous character Lawrence, who is part-revolutionary, part-anarchist, and a voice for the voiceless people. It’s always exciting to design a character from scratch. Wes wanted to hint at what the book fans missed in the second movie, a noseless Crank called “Mr. Nose”. Lawrence is basically a "talking" Crank and kind of insane but able to make conversation. The evolution of the design changed heavily throughout the process. This was the first sketch I sent to Wes. 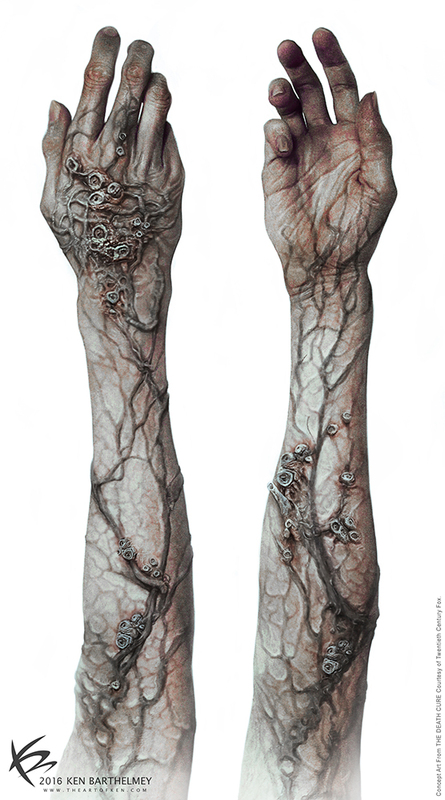 The constant injections of the immune serum enables Lawrence to live longer than a regular infected person. 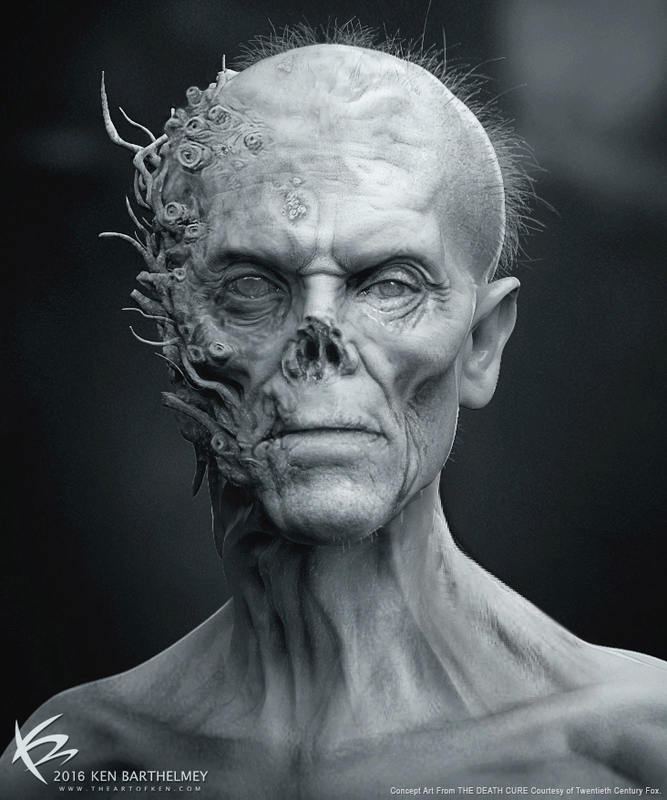 I tried to visualize how his body is literally decomposed from the virus over the years. 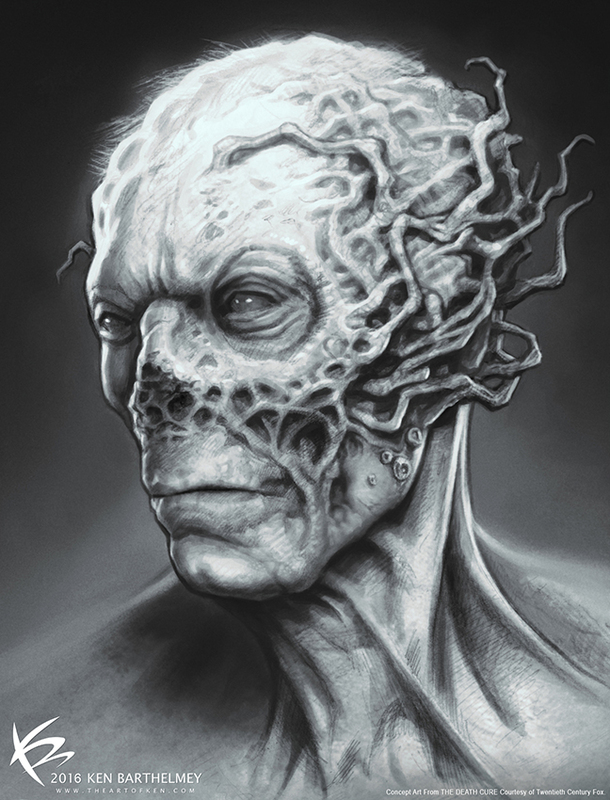 This 3D concept felt a bit too scary and grotesque, but Wes liked the idea of clipped growths which we developed further in following concepts. 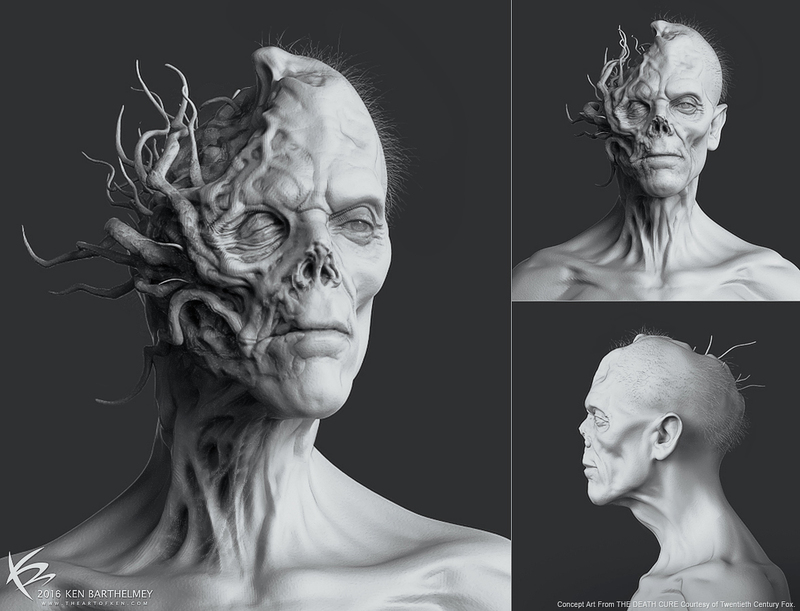 Some Keyshot renders of a 3D maquette I sculpted in ZBrush. Another 3D concept I did of Lawrence. At first we only see him in the dark, not sure what’s wrong with him yet… hence the task was to come up with an interesting and unique shape. Then he steps into the light to reveal; the guy is a monster... 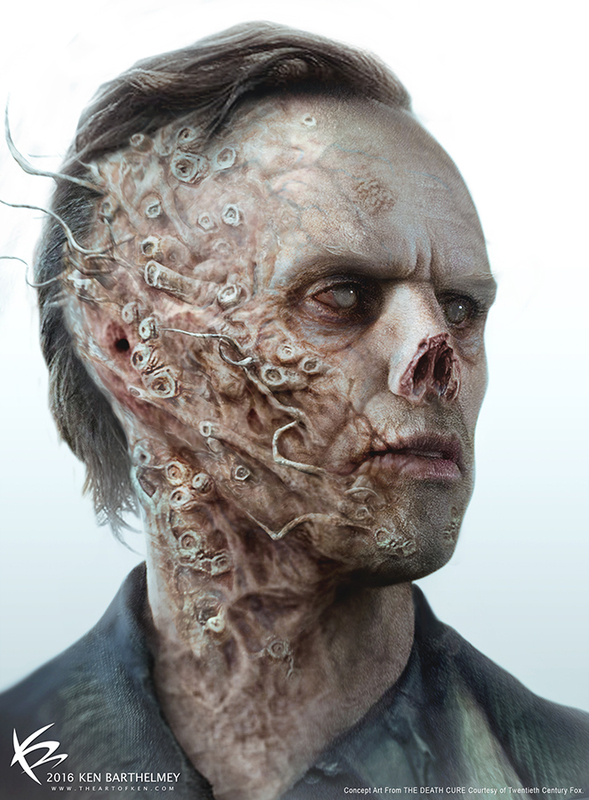 I imagined half of his head has been eaten away from the virus. 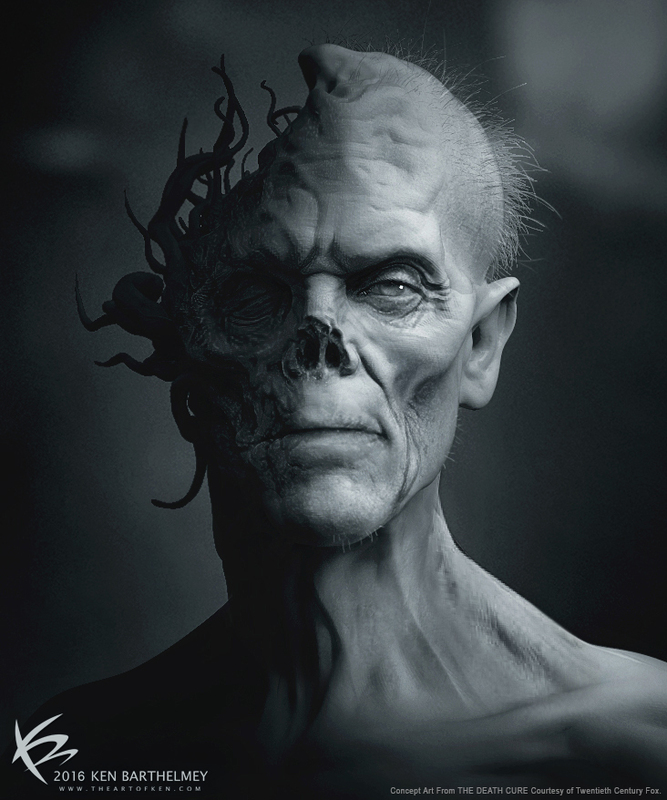 Although the goal was to make him look like a monster, this version still felt a bit too scary and distracting. 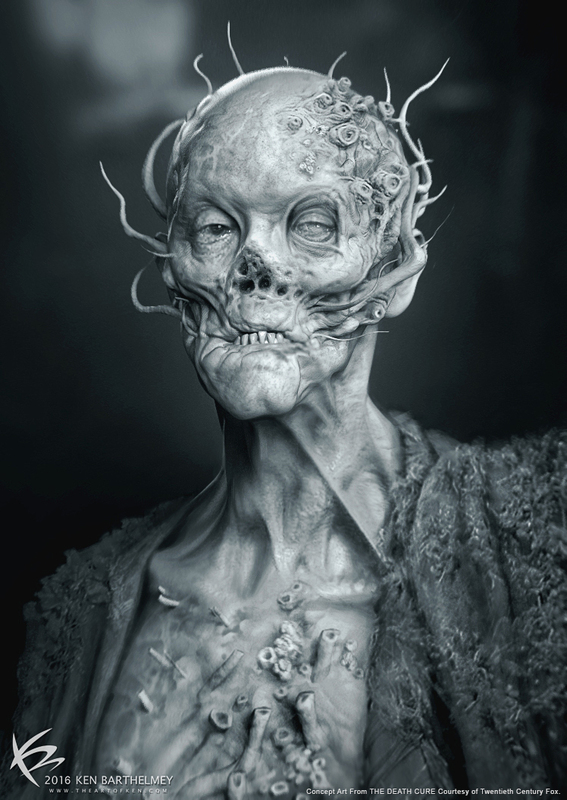 The challenge was to make Lawrence look monstrous, but not to go too distracting with the gore. Wes loved this version as it was less gross and it holds more onto the humanity of the character. Lawrence is a leader and has followers, he is almost priest-like for them. I tried to convey that with this outfit. Also, I made his body heavily crippled to show the side effects of the immune serum and virus. Lawrence in his bathrobe. I tried to come up with a functional way to fixate his IV bag, without the need of a stand. 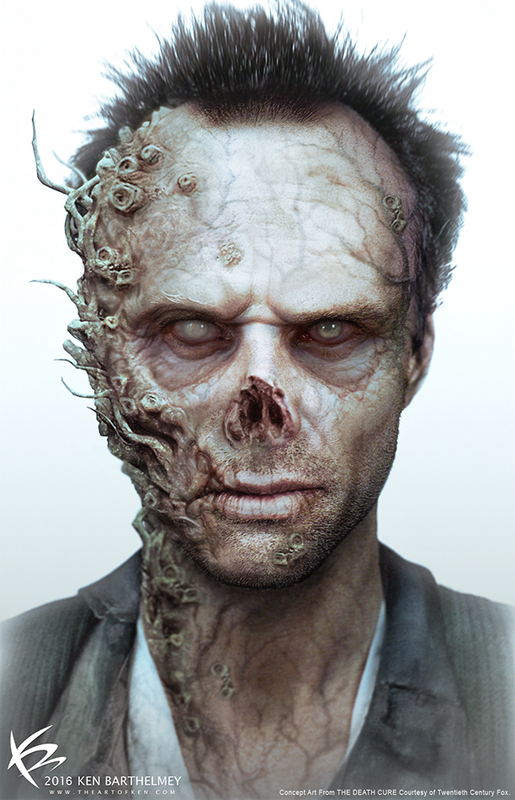 After actor Walton Goggins was cast to play Lawrence, Wes asked me to create a final concept for the make-up. 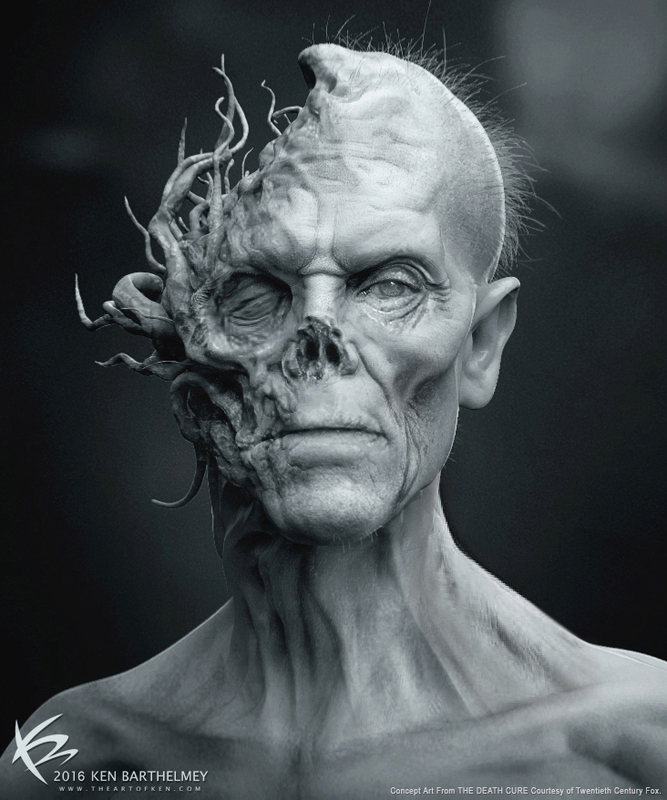 The end result in the film was a combination between practical make-up by Studio ADI, and digital vfx done by Weta Digital. Side view of his ugly side. 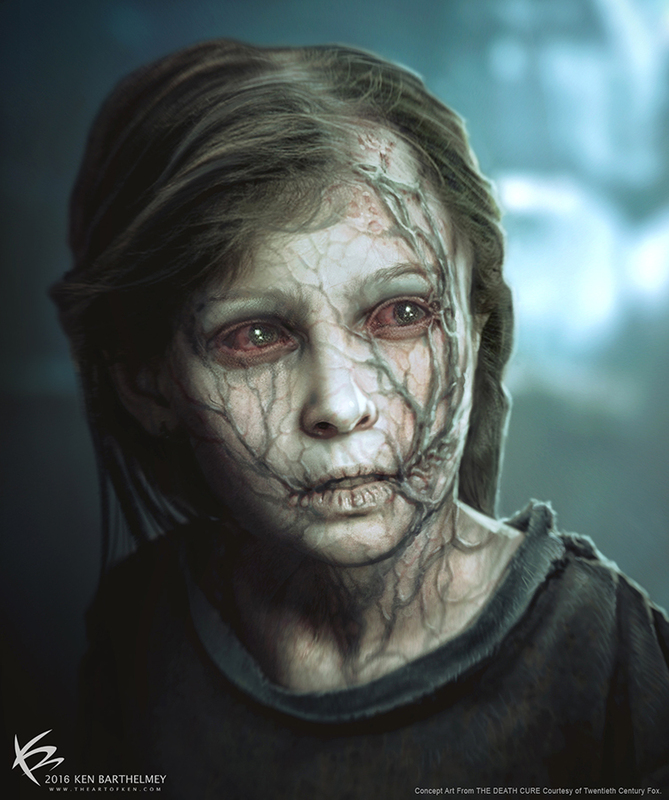 The infected girl that Teresa is trying to cure, had to look human but at the same time sort of scary. It was important for Wes that we feel bad for her. 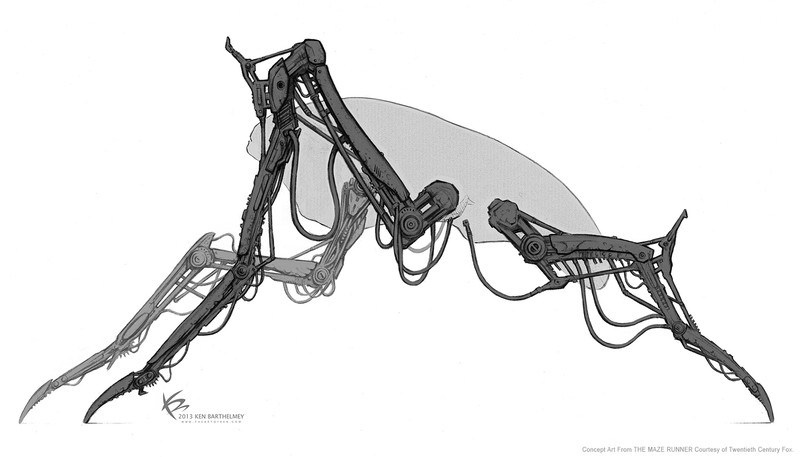 Pencil drawing of the mechanical legs with the correct proportions, used to create the 3D Griever model. 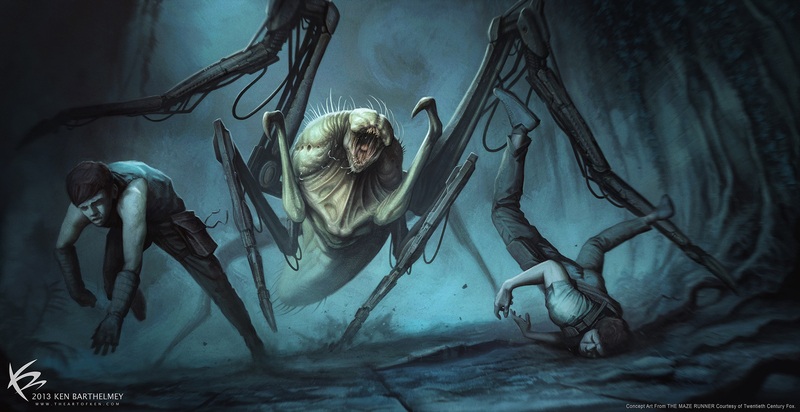 Concept work I painted for Wes when he pitched the Griever Design to FOX, for The Maze Runner.